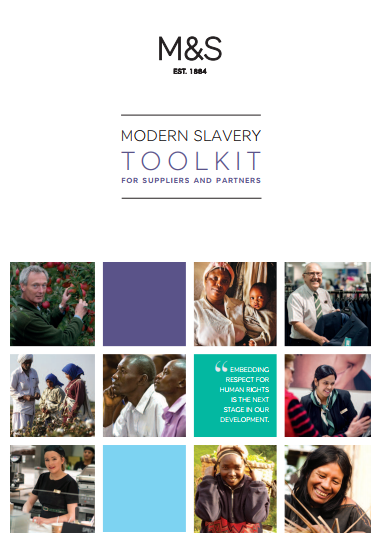 string(1153) "Resource Centre > Uncategorized > Marks & Spencer Modern Slavery Toolkit for Supplier and Partners"
This toolkit is intended to support M&S suppliers and partners to implement a strategy for their business and their supply chains to tackle modern slavery, as well as make clear M&S’ expectations. Increasing legal requirements and expectations from consumers, customers, employees and stakeholders mean that responsible businesses need to place tackling modern slavery at the heart of their corporate social responsibility activities. Supports engagement with employees, employee representatives and suppliers and partners to protect workers and prevent exploitation.